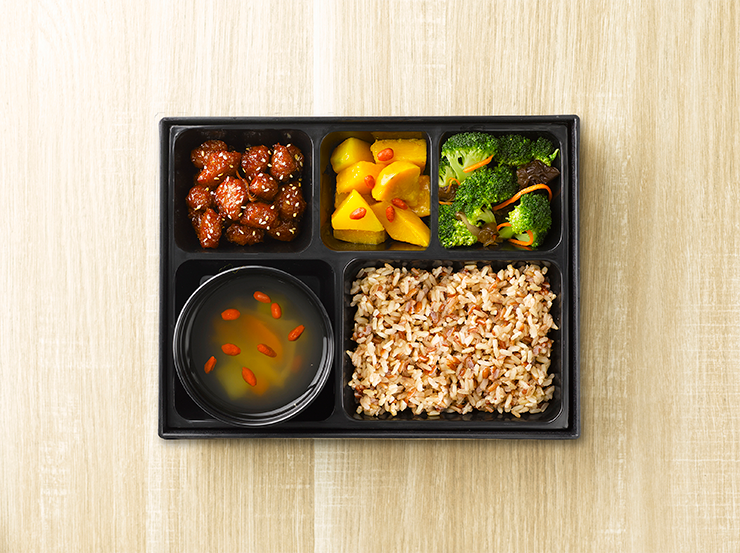 How soul-soothing does this vegetarian bento set from Greendot look? Would you have ever thought that what goes on your plate affects not just your health, but also the environment? Today, copious amounts of meat production have resulted in an increase of greenhouse gases, water wastage and pollution, along with other detrimental effects. But we can help reverse this by saying “No” to having meat on our plates – starting with just one day a week! Enter Meatless Monday. The positive Meatless Monday movement has spurred more folks to reduce meat intake in their diets, and there’s good reason why this food trend has taken off – besides being good for the planet’s health, it’s also great for yours! Eating clean at the start of the week helps your body detox from the weekend’s indulgences, and cutting down on meat intake can also lower your risk of heart problems in the long run. With plenty of plant-based eateries sprouting up and more restaurants adding delicious vegetarian options in recent years, going meat-free has never been easier or more exciting. Check out some of our favourites below. Plant-based restaurants are making a bold statement in their menus, with completely meat-free dishes that push the boundaries of taste. Quite the opposite from simple salad bowls, these restaurants’ fare includes juicy burgers, steamboats and other exciting meat dishes re-created with protein-rich plant foods like tofu, nuts and beans. Abstinence from dairy products is also common, where animal fat is substituted with plant fat. Vegan milk and cheeses are often soy, almond or coconut based, which produce a lighter creaminess with a naturally refreshing sweetness. The idea is simple – it’s not about reducing, but more about replacing, so your palate won’t be ‘short-changed’! 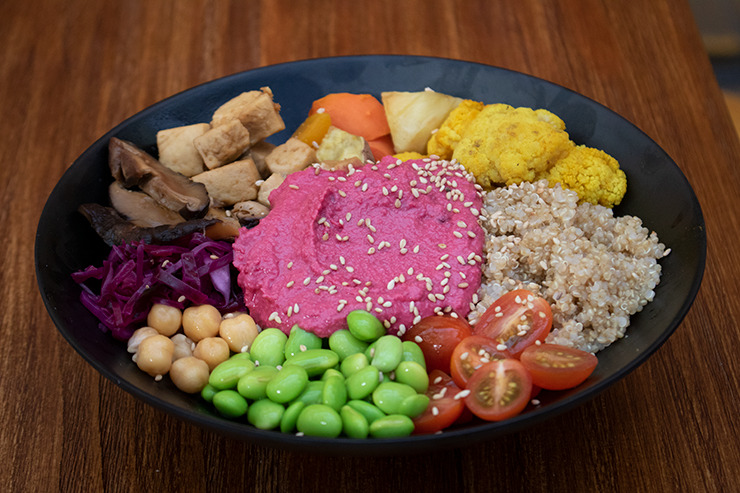 Soul ALife’s signature Buddha Bowl will brighten up your day. Doing some soul searching after that decadent feast? Come reset your palate at Soul ALife, a 100% vegan and plant-based café. With generous natural lighting pouring in, beautiful indoor greenery and simple wooden furniture, everything about this quaint space spells wholesome. Their menu features scrumptious alternatives to all-time favourite food cooked with purely plant-based ingredients. So, expect tasty burgers, rice bowls and more – all meatless and super tasty! For a fresh, palate-cleansing option, their signature Buddha Bowl is a must-try. It’s filled to the brim with nutrient-rich foods such as quinoa, beans, and an oh-so-smooth beetroot hummus that’s light but packs a punch with a mix of unique spices. No additives and preservatives are added to this juicy, freshly made mushroom patty! If you’re craving for something to chow down, skip the fast food and try Soul ALife’s Teriyaki Burger instead. Filling you up without leaving you overly stuffed, everything in this burger stack is divine – from the fluffy wholemeal bun to its flavourful patty marinated in Teriyaki sauce, you’re in for a feast minus the guilt! The more health-conscious will also rejoice because the tasty sweet potato fries on the side are air-fried. 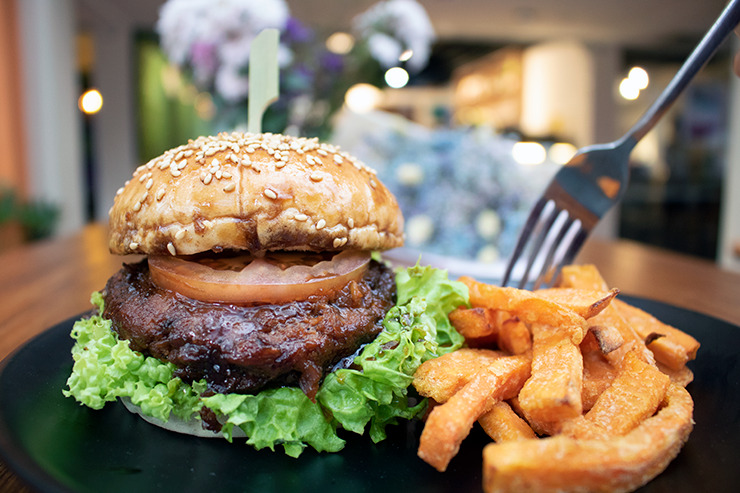 and Teriyaki Burger, $9.90, available at Soul ALife, located at Changi City Point. While Greendot is the largest meet-free chain in Singapore, every dish here has a tender touch of Mum’s home-cooked goodness. With a menu developed together with a team of nutritionists, you can expect to be fed well at Greendot. Lots of premium Chinese herbs are used in their Asian-fusion fare, and their food is also MSG-free. Before you think that healthy equals bland, their exciting menu will prove you wrong. 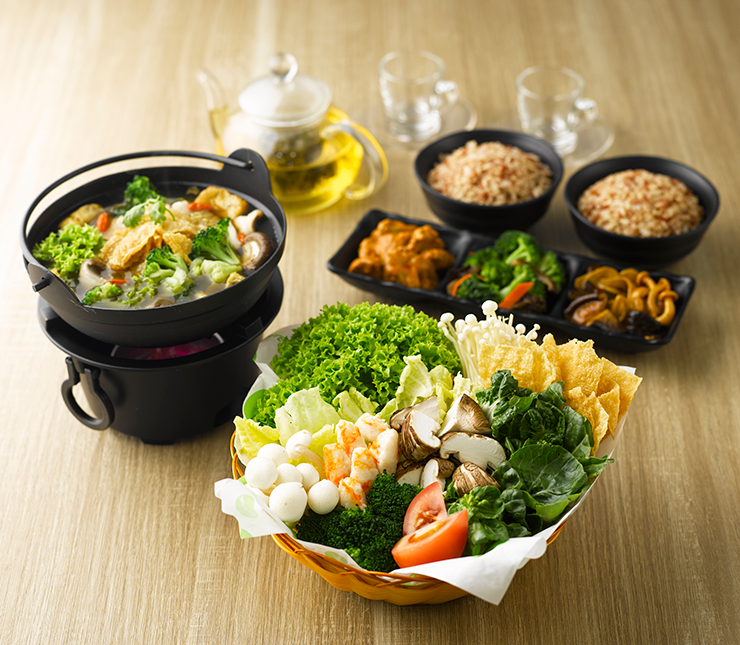 Just check out their Steamboat set for 2 – the spread includes a mixed mushroom platter, 3 bento dishes (1 Main + 2 Greens), 2 bowls of rice and 2 cups of tea. You’ll also get to choose 3 different soup bases with a kick, such as Laksa (Vegan), Herbal (Vegetarian) and Tom Yum (Vegetarian)! So, the next time you’re craving for something belly-warming, you know what to slurp up to! The nutrient rich broth in this noodle soup contains herbs that can aid in blood circulation and reduce cholesterol. 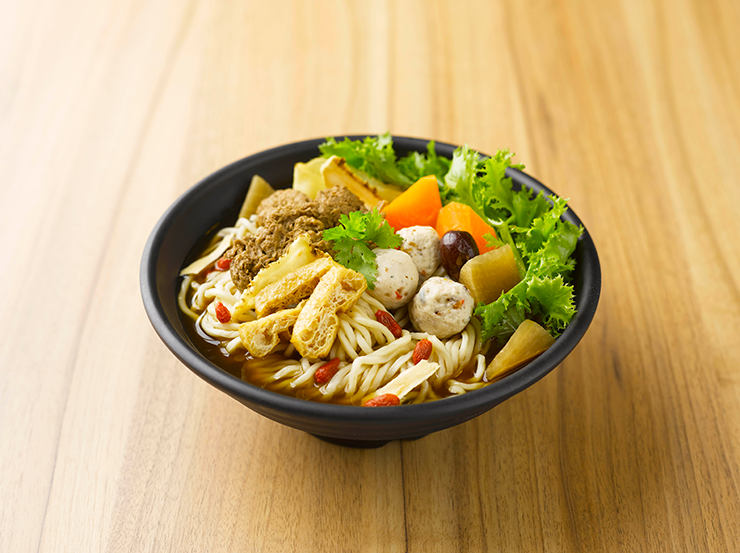 Their Angelica Herbal Noodle (Vegetarian) is also another hearty option that comes with a flavourful herbal broth containing over 10 Chinese herbs such as Angelica, Licorice and Wolfberry. Each bowl is filled to the brim with fresh vegetables and other meat-free ingredients, served together with hand-made noodles. If you’re watching your waistline, check out their thoughtfully curated Under 600 (calories) Menu that can help you reach your health and fitness goals. Steamboat Set for two $35.90 and Angelica Herbal Noodle (Vegetarian) $7.90, available at Greendot is located at Northpoint City. 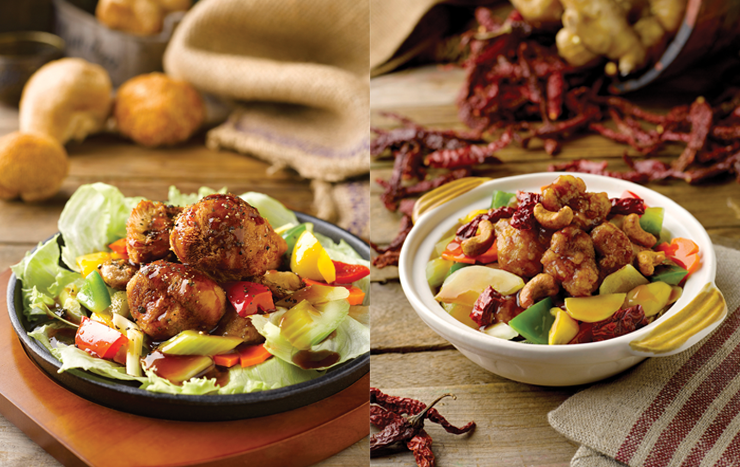 The Hotplate Hericium Mushroom (left) and Claypot Gong Bao Chicken with Black Pepper Sauce. Not willing to give up your comfort food? Check out Green Signature – a vegetarian restaurant that serves your favourite Chinese dishes complete with an appetising wok-hei flavour. Along with using quality plant-based ingredients, the restaurant prides itself in healthy cooking by using healthier oil, less sodium and sugar, and being free from artificial preservatives. The result is robust-flavoured dishes served on sizzling claypots and hotplates. Their Hotplate Hericium Mushroom with Black Pepper Sauce is a hot favourite, featuring "lion's mane mushrooms" that are packed with a range of health benefits, including cognitive health boosting properties. The mushrooms’ tender texture and rich flavour is further enhanced by a simple black pepper sauce, marinated just right for a savoury kick. The Claypot Gong Bao Chicken is one for the spice-lovers, cooked in a hot and sweet spicy sauce, accompanied by crunchy cashew nuts. Coming in generous portions, these dishes are great for a family feast. Complete the spread with the piping hot Claypot Fish Maw Thick Soup that’s now on offer! So, plan your next family dinner here and get your loved ones to get in on meatless dining too! Hotplate Hericium Mushroom with Black Pepper Sauce $16.90, Claypot Gong Bao Chicken $14.90 and Claypot Fish Maw Thick Soup $10.90 (U.P. $21.90), available at Green Signature. Green Signature is located at Northpoint City and Waterway Point. Give these healthy vegan sandwiches a shot! While this homegrown brand has captured the hearts and stomachs of many with their deliciously wholesome cakes, the rest of their offerings also live up to the same homemade authenticity. Alongside their strong healthy-eating ethos, Cedele also advocates for sustainable eating with a Meatless Monday movement at their Bakery Cafe outlets. So, drop by on Mondays to enjoy $1 off their plant-based sandwiches and Do-Your-Own-Salads! You’re in for an awesome treat because Cedele’s bread is baked fresh with ingredients that are low-fat, fibre-rich, and deliciously flavoured with herbs and spices. 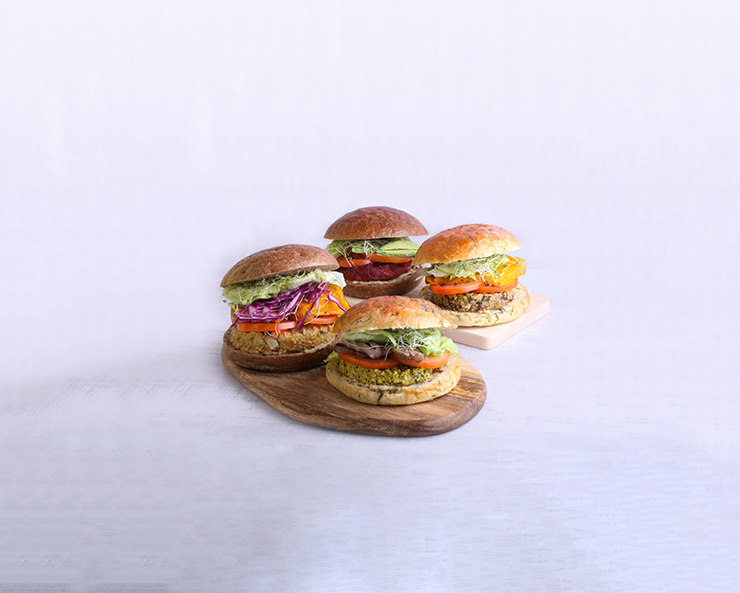 Their plant-based sandwiches are also dressed in low-fat vegan mayo, stuffed with appetising vegan burger patties made from superfood grains such as quinoa, lentils, beetroot and more. When your mind needs a break from the hustle and bustle and your body needs a dose of clean and tasty eating, you know where to drop by! Selected Cedele Bakery Cafes are located at Changi City Point and Frasers Tower. Get a lunchtime boost with sandwiches stuffed with the freshest ingredients. For years, this hidden gem has been attracting flocks of nearby office workers to its cosy little space at Alexandra Technopark. Its main draw? A hearty breakfast platter with quality ingredients at an affordable price. But aside from their usual fare, they’ve also got plenty of meat-free alternatives on their menu such as a vegetable burger, veggie sandwich, Classic Margarita Pizza and more. Their veggie sandwich is a no-frills dish that hits the mark with consistent freshness. 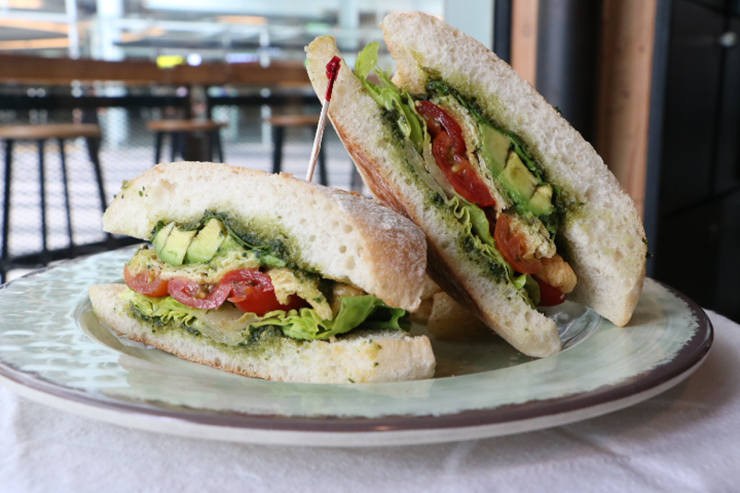 Creamy chunks of avocado, soft Japanese tofu, herbed tomatoes, crisp lettuce and arugula are stuffed between two slices of sourdough wheat bread, made from scratch at their own bakery. It’s so appetising, it could very well become your lunch staple! Even if you don’t work in the area, Food Barn is definitely worth checking out. Their recently revamped space at The Hub in Alexandra Technopark features a lovely and homely ambience surrounded by lush greenery. Not a bad spot for a catch-up too! Food Barn is located at Alexandra Technopark. Famed for its quality and affordable fusion dishes, 49 Seats also serves up seriously flavourful meatless pastas. They’ve got two stellar options on their menu, whether your palate is up for something rich and creamy, or if you’re craving for a tangy treat. 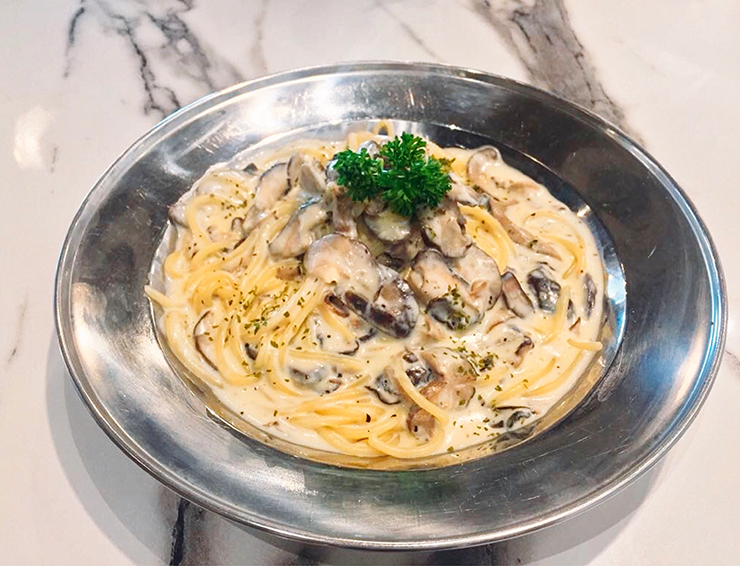 Their Creamy Wild Mushroom Pasta comes in a generous portion with a well-balanced cream sauce that doesn’t become overwhelmingly cloying – you’ll even find yourself slurping it up till the very last drop! Completing the dish are fresh and tender sautéed mushrooms, along with perfectly cooked pasta with just the right bite. Likewise, the Tomato Mushroom Pasta is an equally satisfying dish featuring fresh tomato-based sauce with a consistent texture. If you’re a light-eater, here’s a little secret – they also serve a Classic Algio Olio that’s not on their menu. Lightly flavoured with olive oil, chilli and herbs, this savoury dish gets more delightful with each bite. and Classic Aglio Olio, $10.90 (nett) available at 49 Seats. 49 Seats is located at The Centrepoint. You’re not a full-fledged cheese fan if you haven’t tried this! If you love hanging out at the cosy Eighteen Chefs but have yet to try their meatless dishes, then make it a point to savour their delicious meat-free offerings! 3 different types of cheeses along with sautéed mushrooms drizzled with truffle oil. Don’t miss this if you’re crazy over cheese. But if you prefer sticking to old favourites, simply opt out of meat toppings when you customise your Cheese Baked Rice. Instead, select their tasty meatless toppings such as butter corn, mushrooms, scrambled eggs and broccoli. Then top off your dish with any of their 9 sauces! Plus, if you haven’t already heard, Eighteen Chefs is super wallet-friendly especially for students. Their Cheese Baked Rice student meal comes with an ice-cream and a glass of Iced Lemon Tea from just $7.20 onwards! 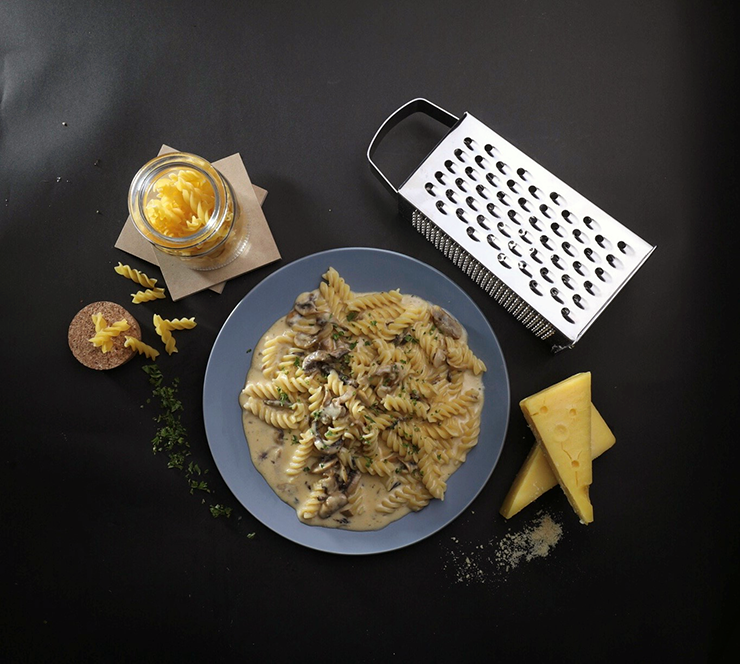 The a la carte Cheese Baked Rice is priced at $9.20 and Truffle Cheese Fusilli is priced at $12.80. Eighteen Chefs is Halal-certified and located at Northpoint City and YewTee Point. Exotic cuisine is certainly not off the books when you’re going meatless. Take popular Mexican eatery Guzman Y Gomez (GYG) for example. Their tasty burritos, burrito bowls, salads and nachos can also be enjoyed sans meat with delicious sautéed vegetables and fresh house made guacamole, using GYG’s favourite Australia Hass air flown directly from Sydney. Savour uncompromised Mexican flavours with authentic herbs and spices in their vegetarian options. Guzman Y Gomez is located at Northpoint City. If your palate isn’t ready to take the plunge yet, then try going meatless on a monthly basis. You’ll soon get the hang of it and feel so refreshed, you’ll be wanting to go meatless more than once a week!